This elegant apartment was completely renovated in 2012. The predominant colour is white, which combined with the beautiful wooden ceiling beams offer a warm and cozy ambience. 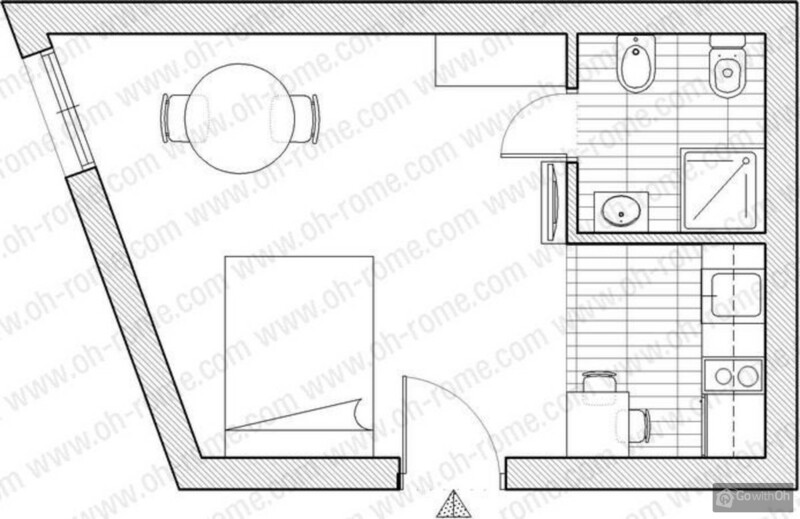 The 40m2 apartment has been specially designed to accommodate up to two people. It is located on the ground floor (without a lift) of an old building in the heart of the typical neighbourhood of Trastevere. The main entrance leads onto a beautiful lounge with a comfortable double sofa bed, LCD television, table and chairs. 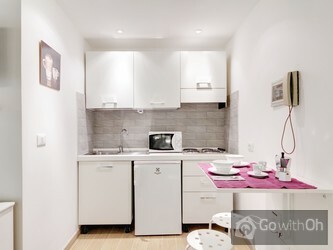 The same room has a well-equipped modern kitchen corner area. The bathroom has very careful decoration and a shower cabin. There is also free WIFI internet connection available throughout the house. This is the characteristic neighbourhood of Trastevere, just three minutes walk from the famous church Santa Maria in Trastevere. The strategic location allows visitors to walk comfortably to all the most important places of tourist and historical interest in the city. A walk across the bridge, the Ponte Sisto and over the Tevere River leads to the heart of ancient Rome, and from here it is easy to get to the Piazza di Spagna, the Fontana di Trevi and many other attractions. The area is home to numerous shops, wine cellars and restaurants to taste authentic Italian cuisine. This is the ideal accommodation choice for all visitors to Rome whether for work or pleasure, and who want to feel completely at home. From 2 pm to midnight. After midnight: extra charge of 20. The owner is flexible for check-in outside of the normal check-in time, based on the availability of the apartment. A babys cot is available free on request. Nous avons passé un excellent séjour sur rome. Nous avons été très bien renseigné par F lors de notre arrivée à l'appartement. Le logement est très bien équipé et rénové recemment. L'appartement en RDC est situé dans le quartier du trasteveré, quartier très typique de l'italie. Les ...animations et les restaurants sont nombreux. C'est vrai, parfois un peu de bruit jusqu'à 23h00...restaurant en face de l'appartement mais c'est général...il faut faire avec.. Very nice location and all the city is available by foot! La ubicacion es perfecta, en una tranquila calle a escasos metros de zona mas animada del Trastevere. Y suficientemente cerca para ir andando a todo aquello que quieras visitar. Apartamento muy bien ubicado en un barrio encantador y cerca de todo. Tiene todo lo necesario para tener una buena estancia. E. nos dió la bienvenida y nos ofreció su ayuda por si necesitabamos algo en nuestros días en la ciudad. Todo perfecto! The owner E. was fantastic, he was so helpful and provided lots of information about the best places to see in Rome. The apartment was perfect and in a great location. Outside of the busy centre but still within walking distance of everything you needed and surrounded by plenty of nice restuarants ...and pizzerias. Go with Oh were professional and dealt with our enquiry and booking in an efficient manner providing all the information we required. We would definitely recommend this holiday to others and will be returning ourselves one day! Situado justo al lado de la zona más animada de Trastevere, aunque en una calle tranquila. Justo en frente tiene un muy buen restaurante. Acceso rapido a pie a los principales monumentos. Necesita una actualización del menaje. The apartment was just as seen in the photos very clean and beautifully presented. We had excellent service from the owners and they were very helpfull and easy to contact before and during our stay. The location was perfect for walking to all the sites, wine bars and restaurants. We would ...definitely stay at this apartment next time we visit Rome. Wir waren sehr sehr zufrieden! De agradecer la amabilidad de F. q a pesar de llegar a la 01:00 nos dedico un rato a explicarnos q ver y q hacer en Roma y nos dio un plano de la ciudad. En el apartamento había de todo, azúcar, sal, café... champú, gel. El apartamento es tal y como se ve en las fotos, precioso. También ...señalar q la cama es magnífica, q el caudal del agua de la ducha es estupendo y q nos dejo abandonar el apartamento a las 14:00. La situación inmejorable, no cogimos transporte en toda nuestra estancia y a pesar de estar en pleno Trastevere, la calle donde esta ubicado es silenciosa. Creo q es el mejor barrio para pasar unos días en Roma, tiendas, restaurantes, bares, cultura...Se lo recomiendo a todo el mundo. Pour tous ceux qui aiment visiter les villes à pied (c'est notre cas),ce logement est très bien placé. Il est proche des principales attractions de Rome, Il est de plus au coeur du quartier du Trastevere, particulièrement animé et typique. L'accueil du propriétaire est excellent. Seul bémol. Les voisins du dessus sont un peu bruyants la nuit. EStancia genial , F magnifico nos guio y ayudo.. Repetiremos. 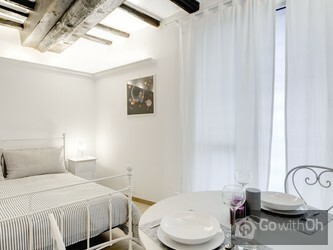 The apartment is right in the heart of Trastevere, It's really nice and cozy! we had a great time there and F. is a really nice persone he came to pick us up to the station!! he knows what hospitality means! super sauber, sehr gutes Bett, schön eingerichtet. Kleines Manko: leider nur Milchglasfenster, da Erdgeschoss. Kommen gerne wieder. The contact person was very friendly and gave us a lot of tips for our stay in Rome. 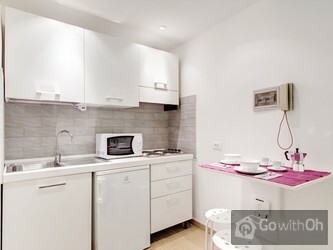 The appartment was very clean & comfortable and is located in a nice little street in the middle of Trastevere. There are a lot of nice restaurants close to the appartment. Thanks a lot for everything! Booked late and still got a great place! In all ways. / The location: a relatively quiet, but well located, small street in lively Trastevere, Great restaurant right at the doorstep /The apartment: small, clean, pleasant, fully equipped / The contact, F.: Extremely helpful, punctual, ...informative--his tips and comments were excellent / The system: Pleasantly efficient--to review, select, reserve, find, pay....etc. How delightful to have a small place in a world city! El trato con Fabio fué muy bueno, nos indicó sitios donde comer y lo más importante para visitar en Roma. El apartamento estaba muy bien, tal como aparece en las fotos. El único problema es que está a nivel de la calle y la puerta de entrada al edificio da golpe cuando se cierra y se oye mucho.... La situación es muy buena porque hay muchos sitios para comer de todos los niveles de precio. We've had a wonderfull stay here. F. has been the best, he showed us where to go, made sure we had everything we needed and made sure we didn't have to drag our luggage all over town at check out-day. 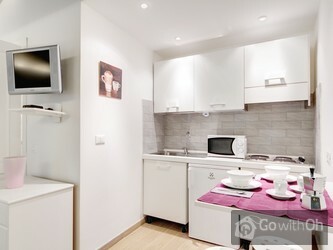 The appartment is as shown on the photo's and its location in Trastevere is a great starting point for any vacation. La estancia en Roma ha sido fantástica. El apartamento es muy amplio, recién reformado y está en pleno corazón del Trastevere. Además, a pesar de la vida nocturna del barrio, el apartamento está en una calle muy tranquila, con muy buenos restaurantes a menos de 2 minutos a pie. F. nos recibió... de manera muy atenta y nos facilitó un montón de información interesante sobre Roma. Se agradece que el último día nos permitiera dejar las maletas allí hasta la salida para el aeropuerto. SIn duda, si volvemos a Roma, repetiremos con F.
Estuvimos muy a gusto, todo perfecto, localización, ambiente, tranquilidad teniendo en cuenta que a tan solo una manzana la zona está plagada de restaurantes y bares de copas.. F. nos trató muy bien, indicándonos los puntos de interés y cualquier duda...a 15 minutos a pie de todas las zonas de ...interés turístico. A recomendar el Rte. Da Gildo..Volveremos!!!! The apartment was cozy, romantic, well equipped and in an excellent location! F. the owner is charming and amazing! He helped us to plan our stay in Rome, and he was there for us when we needed his help. Next time we get to Rome we already know where we'll stay! The apartment is just perfect! Highly recommended. L'appartement est propre et moderne, avec un lit très confortable. Notre contact F. était sympathique et efficace, prenant le temps de nous indiquer les endroits incontournables. Seul bémol, l'immeuble est mal insonorisé, mais les nuits y sont calmes. Estimado Cliente, Desde Oh le damos las gracias por sus comentarios. Lamentamos que su estancia no haya sido del todo agradable. El propietario nos confirma que el problema con el atasco del W.C. se ha solucionado inmediatamente, así como la falta de agua caliente, que se ha solucionado al día siguiente y ha sido compensada debidamente con la devolución de la noche afectada por la falta. Finalmente confirmarle que se han proporcionado dos rollos de papel higiénico y un juego de toallas por ocupante, de acuerdo con las condiciones de alquileres de apartamentos turísticos. We loved the apartment, the location, and this area of Rome. This is a great walking neighborhood, and you are close to cafes, shops, restaurants. It bustles with activity but it never seems too crowded. And F. was great in giving us valuable information to dig deeper into life in the Trastevere. great apartment & location right in the heart of trastevere only a street away from the many bars & restaurants F the owner was there to meet & greet us, he spent 30 mins with us explaining what & where to see the best sites & how to get there, would use this apartment again. The apartment is perfectly adequate for a city break stay it was clean and well equipped and is in Trasteverre which is lovely to go out in after a busy day sightseeing it is very vibrant with great food and bars and is very inexpensive and very safe. You can walk everywhere from this apartment we ...did all the sights and walked to every one. The guy F who met us at the apartment was brilliant i had good e-mail conversaions with him prior to arrival and he was there to meet us and spent 15 minutes with a map of Rome showing us where to go and advised us where to eat he saved us time and money and we alsop saw some things we probably would have missed. Simplemente excelente. Muchas gracias F por tu inestimable ayuda y atención hacia nosotros. La casa es un canto a la Roma de Fellini. Totalmente aconsejable por limpieza, ubicación y encanto. Repetiremos seguro. F was wonderful, he provided great information that helped us have a wonderful stay in Rome. The location was ideal, as it was close to all the major attractions and excellent food. The apartment was on a side street in Trestevere, so it wasn't nearly as loud as the main streets or squares. However,... the apartment was on the main floor and next to the main entry door, so you could hear people coming and going. Would not suggest for light sleepers as there is also a restaurant across the street, although it was not especially noisy.The apartment was exactly as pictured, clean and generally perfect for our party of two. The unit's hot water heater was slightly small and did not always have enough hot water for two long showers. Overall great stay, would recommend to anyone. Appartement bien équipé et bien situé décoration de bon goût. Excellent pour un séjour de 2 à 3 jours car situé dans une petite rue sans luminosité et jouxtant un restaurant. Propriétaire sympathique et très accommodant. Niestra estancia en Roma fue maravillosa. Nos encantó la ciudad y, sin lugar a dudas, volveremos a ella y al mismo lugar, el trastevere. Apartamento muy recomendable, limpio y excepcionalmente situado; en pleno corazón del trastevere. F, la persona de contacto del apartamento, tuvo un trato ...exquisito con nosotros y nos dió unas recomedaciones valiosísimas para visitar la ciudad y lugares para comer. Perfecto y fantástico todo. Si alguien quiere vivir Roma desde dentro, este es el lugar ideal. La ubicacion es mas que perfecta y el apartamento estaba fenomenal. F se tomó la molestia de explicarnos con un plano como nos podiamos organizar y los mejores sitios para comer. Sin duda repetiria en el mismo sitio. L'accueil de Fabio, la situation géographique, nous sommes prêt de tout. la vie du quartier est vivante. Endroit idéal pour visiter. Do you have questions about this apartment? Please, use the search box to know availability and prices. If the apartment doesn’t appear as the first on the list, it’s because it will not be available for the dates you are looking for. If you have questions about the apartment just let us know. Oh-Rome - your trusted host in the city. All rights reserved.